The ultimate product for high heat output. 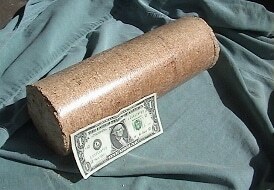 Energy Logs are significantly better than even the best cord firewood in producing a very hot, long burning fire. The secret is in the manufacturing process. 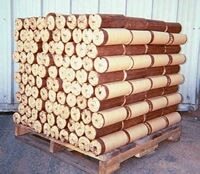 These logs are made from high BTU species wood fiber (recycled mill waste) and compressed under extreme pressure to form a very dense and heavy log that is very dry at less than 7% moisture content. Because of this, there is almost no creosote when the logs are burned. The high density and low moisture content of the Energy Log enables it to pack 8,600 BTU’s per pound. 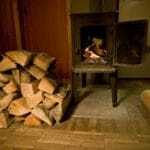 The best seasoned and dry birch firewood is only about 7,700 BTU’s per pound at best and costs almost 3 times as much as an Energy log. 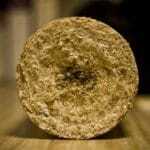 The Energy Logs higher performance kicks in when they go into a secondary combustion about 1½ hours after ignition, creating a very intense heat. 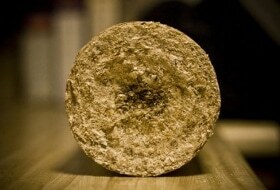 Regular firewood often cannot get to this stage as it is not as dense and dry. 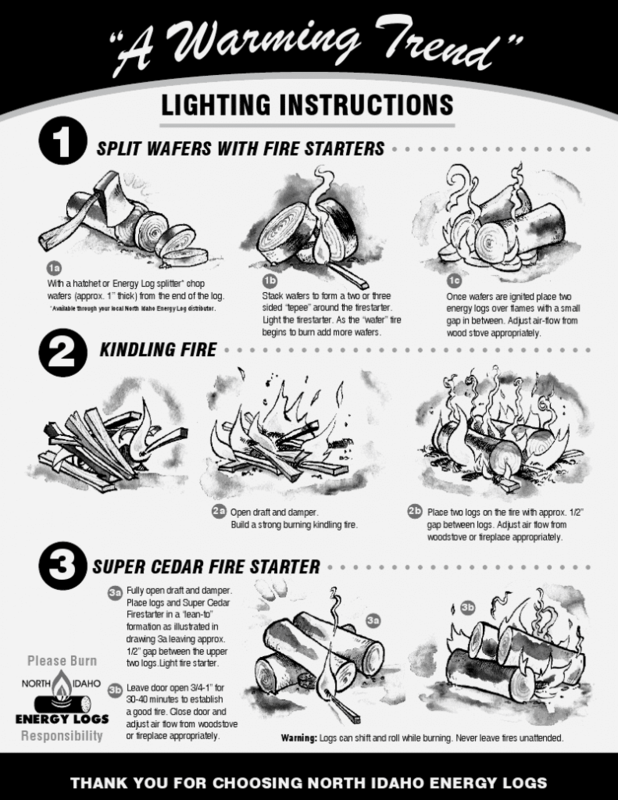 There is very little waste, ash or smoke as the entire log is burnt up during the intense secondary burn phase. 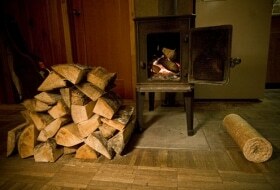 The Energy Logs work best in woodstoves if you are concerned with optimum heat output. 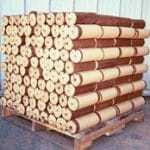 They are extremely efficient when compared to regular firewood. The extra heat output is instantly noticeable. 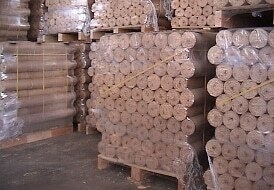 You will use only 1 or 2 of these large, heavy Fire logs in most stoves and these will last overnight on low settings. 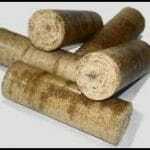 For open fireplaces where a higher flame creates the ambiance desired by many, the logs do not exhibit larger bright flames like cord wood, the Energy logs are optimized for slow, hot burning in wood stoves. For a traditional bright fire in your fireplace, you can mix some regular firewood in with the logs to get heat value, longer burn time and a brighter higher flame. 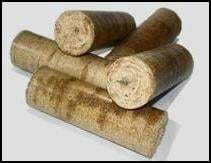 We use them in our fireplace and enjoy the quality of the fire and especially the heat output, we are often forced to move farther away when burning energy logs which is not a bad thing! This One Ton Pallet of 240 (8 lbs. 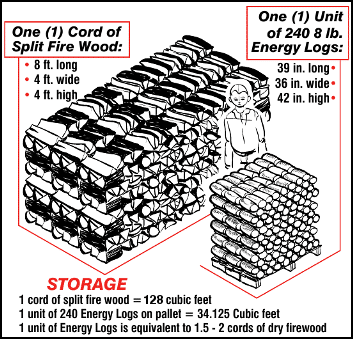 each) Energy logs is equivalent to roughly 2.5 cords of regular pine firewood or about 2 cords of dry birch. 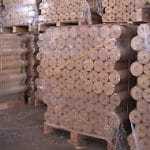 The Energy Logs are very economical, less than half the price of good birch firewood when compared to BTU output and burn time. 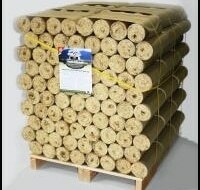 You can order your energy logs for delivery by the pallet direct from Lions Garden or pick up from our yard in Lindbrook. 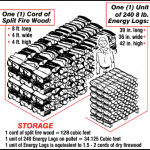 Compare prices at local big box or chain stores of other less efficient fire logs at $15.00 – $29.00 for an average 15 to 20 Lbs box, Energy Logs are cheaper per pound and have much higher heat output and longer burn time ! We do deliver, please inquire for your quote. 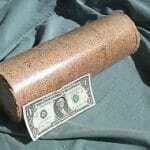 For payment we accept cash, all mayor credit cards, sorry no debit. 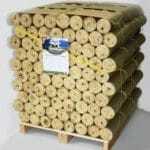 1 Pallet of ENERGY LOGSHas The Heating Capacity of1.5-2 CORDS FIREWOOD.